Winner of the Nobel Peace Prize and former political dissident Aung San Suu Kyi has intervened in a dispute between Burmese authorities and local residents protesting a China-backed copper mine in the north-west of the country. Local authorities mounted a crack down on the rally at the Latpadantaung copper mine early on Thursday, using water cannons, smoke bombs and flare guns to disperse assembled protestors. Fires in protest camps have reportedly left dozens of people injured. The Nation reports that Aung San Suu Kyi, who currently heads the Burmese opposition, has visited protestors injured during the crackdown at a hospital in the city of Monyway, and vowed to resolve the conflict by peaceful means. 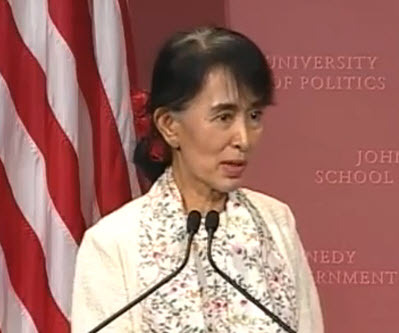 "I will negotiate peacefully and successfully for both sides" said Suu Kyi while speaking with protestors. The Latpadangtaung copper mine is a joint venture between Economic Holdings Ltd, a company owned by the Burmese military, and China's Wanbao Co Yang Tze Copper Ltd.
Construction of the mine has triggered widespread resentment amongst local residents as a result of evictions and land grabs, yet government representatives have informed villagers opposed to the project that they are fearful of China's response should the development be shelved.